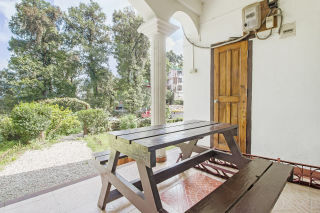 Located 2 km uphill from the Mall Road, this offering of a five-bedroom bungalow can accommodate up to ten guests. This bungalow is perfect for large groups. The bungalow boasts an indoor fireplace. Ample parking space is available for those on a road trip. The services of a chef are available to cater to your meals. Your Space The bungalow has a stately façade, with webbed stone textured walls and a green gable roof; potted plants and garden shrubbery dot the entrance. Inside, the living room boasts a large fireplace with a vintage wooden mantel. A group of four chairs with a marble-topped high table is ideal for a game of poker with your travel companions, while a crackling fire ensures you are cosy on a cold evening. 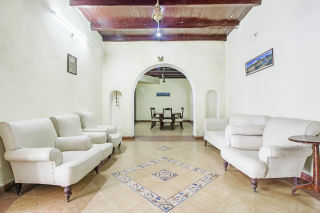 An arched entryway leads into the other side of the long room, which is furnished with well-stuffed couches that provide ample seating. 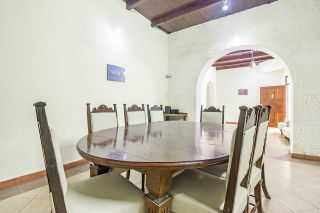 A six-seater oval dinette is placed so you can savour delicious meals prepared by the chef. The bedrooms are spacious and well-appointed, with comfortable double beds, low fretwork chairs, ample wardrobe space, a mirrored dresser, and a small TV. Bright-hued accent walls breathe life into the space. The washrooms are well tiled, fitted with modern sanitary ware. 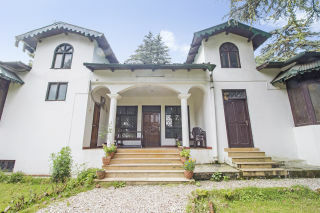 This is a cottage located around 2 Km uphill from Mall road in Nainital. 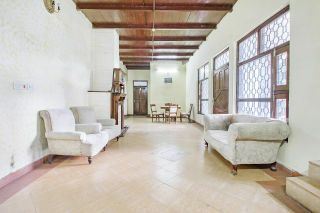 This cottage is fully furnished and well equipped with all modern amenities. The views from all the rooms of this cottage are breathtakingly beautiful. 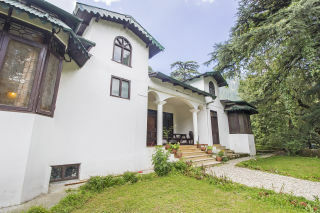 This place is truly a great place for travellers who wish to enjoy the simple life in Nainital. The food served here is delicious and the cuisines offered include Indian, Chinese, Continental and Kumauni. They also provide fun adventure activities with trained instructors.